Saint George Greek Orthodox Cathedral in Philadelphia is probably one of the most exquisite and remarkable churches in the city. When we documented a wedding there for the first time, I was amazed by all the delicate ornaments and paintings, by its remarkable vibrancy and the richness of the interior texture. The overall feel of the church itself is impeccable. 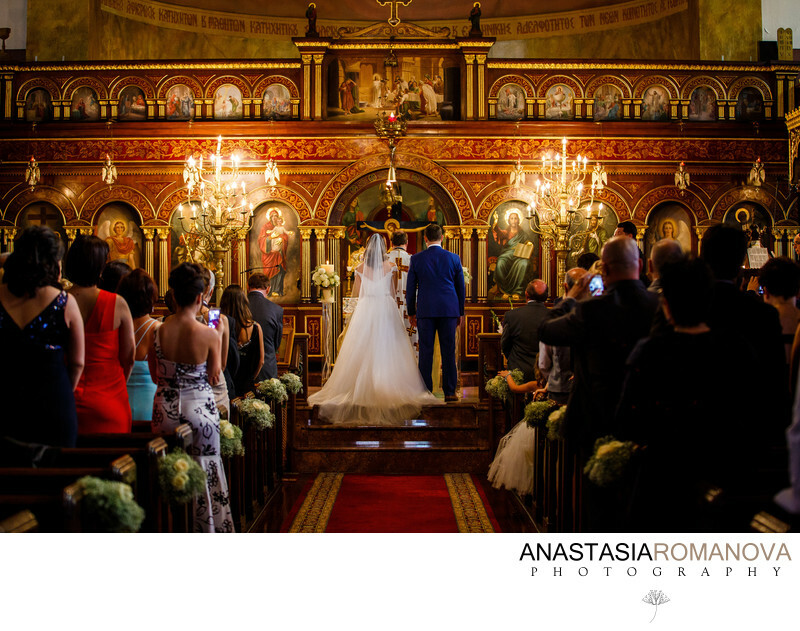 This photograph was taken during the greek orthodox wedding ceremony. The grand candle holders framed the couple perfectly and all the horizontal lines and decor elements fell into place just as we needed. All those compositional elements helped to create the overall of the photograph more balanced and bring the viewer's eye directly to the bride and groom. To get this shot, I had to stay all the way back in the end of the aisle. Throughout the ceremony we do our best to stay as quite and discreet as possible in order not to draw any attention and not to be distractive by no means. The only light available in the room was the ambient light coming from the candles and two grand dim chandeliers hanging from the ceiling. We almost never use any external flash light during the wedding ceremonies in order to render the original natural look and atmosphere of the scene. Canon 5D mark III; ISO 1600; 70mm; f/2.8; 1/80 sec. Location: 256 S 8th St, Philadelphia, PA 19107.